Église St Eustache at Les Halles is quite particular. Pretty, but particular. The last Gothic church built in Paris, it took over 100 years from the laying of the first stone of the current building to completion. Well, sort of. It was never completed to its full Gothic glory (hence stumpy spires found today instead of elaborately decorated ones) and during the long construction period, it also transitioned into Renaissance architecture, making it a rather unique building all in all. This set of doors is but a small part of the cathedral which I thought is rather cool. 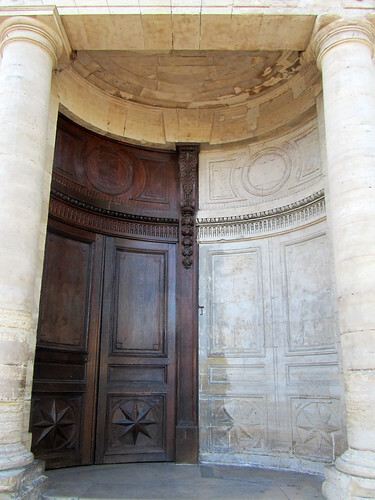 It’s the perfect symmetry between the wooden doors and the stone walls, around a semi circular nave. I must admit to not have investigate it very closely, but from where I stand, it’s a harmonious matching that had me admiring whomever the mason who came up with this idea. Day 227: J’attends… Day 229: Cours d’Anglais. Ou pas.